elegantly furnished rooms feature two queen beds and touch panel technology. The luxurious bathroom offers a walk-in glass enclosed soothing rain shower. Two steps forward in this chic, lively 2 Queen Deluxe room will set the stage for a memorable experience with family & friends. From 340 sq. ft. revel in natural lighting, wireless internet, digital control, Nespresso maker, mini bar, 50” TV with Bluetooth and spa inspired bathroom. It takes two to feel the essence of the waterfront in the 2 Queen Premier Riverview. The natural lighting from the floor to ceiling windows frame the setting of the Potomac River. From 340 sq. ft., enjoy a Nespresso maker, 50” TV with Bluetooth, digital control and spa inspired bathroom. Ready for the sunrise or sunset? Then enjoy the scenery & sun while standing on the balcony capturing views of the Potomac River & D.C.’s skyline. From 340 sq. ft. revel in the sun with floor to ceiling windows, Nespresso maker, digital control, 50” TV with Bluetooth & spa inspired bathroom. Residentially styled with ample living space, InterContinental Washington D.C.’s – The Wharf presents a rich and luxurious suite environment bathed in natural light. 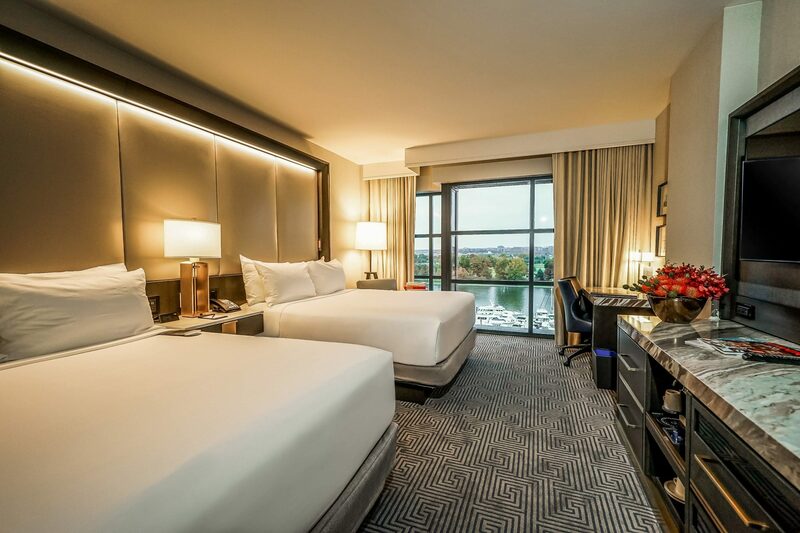 The refined retreat features a king-size bed, spacious closet space, an executive work desk and unrivaled views of the Potomac River. A generously sized living area provides an ideal setting for relaxing and entertaining. The spacious bathroom offers a glass-enclosed floor-to-ceiling rainfall shower, luxurious soaking tub and double vanities.